Finally getting around to the 2nd part of the great envelope that Dennis from Too Many Verlanders sent my way a week or 2 ago. With all the serial #'d cards in the envelope to feature, I figured it was a good time to revive the Serial Saturday concept after a 6 month hiatus. How about a little 2000-01 Crown Royale to start off. It was pretty difficult to find, and then see the serial #'s on these cards. If you look very closely, you'll see the serial numbers just above the name plate on the far right side. 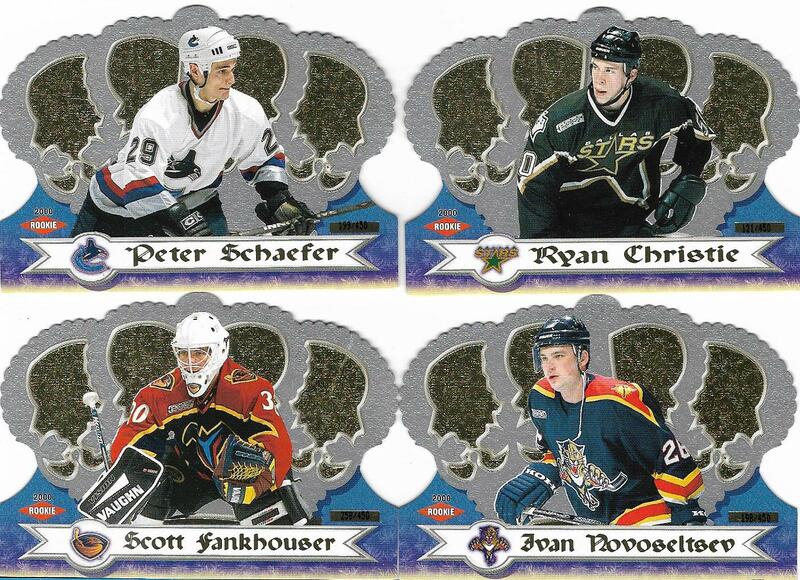 The Scott Fankhouser card will count for the Jets as they were originally the Atlanta Thrashers. Dennis sent two copies of the Matt Stajan card in the middle, so 1 went to the serial #'d set, and the other goes in the Leafs collection. 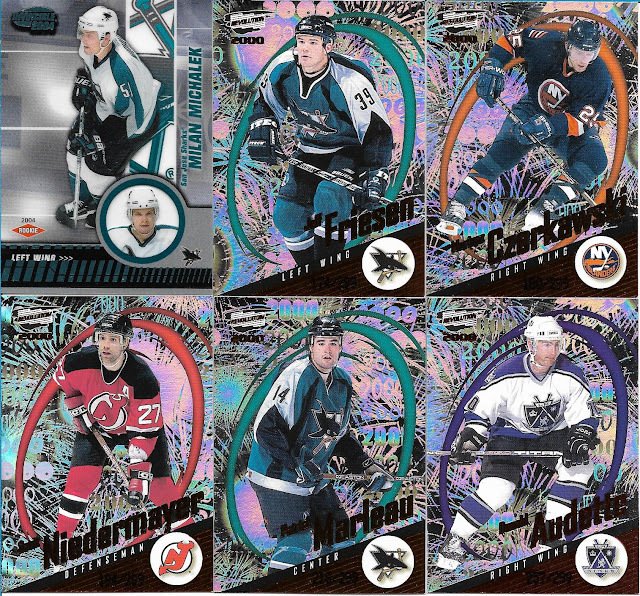 I think the last time I saw as many players on a card was back in the early 70's, but the Todd Marchant card on the bottom featuring some high traffic in front of the net is a beauty. It's also hard to see, but the card is a retail ltd. parallel, limited to just 149 copies, and the Marchant version knocks #3 off of the list. Goalies!! If anyone asks you at a party what goalie holds the NHL record for the longest shutout streak in history, you can tell them that one of these 4 goalies holds the record. It's the goalie wearing the winged P, as Brian Boucher holds the modern record at 332 minutes and 1 second (just over 5.5 games for you non-hockey readers). 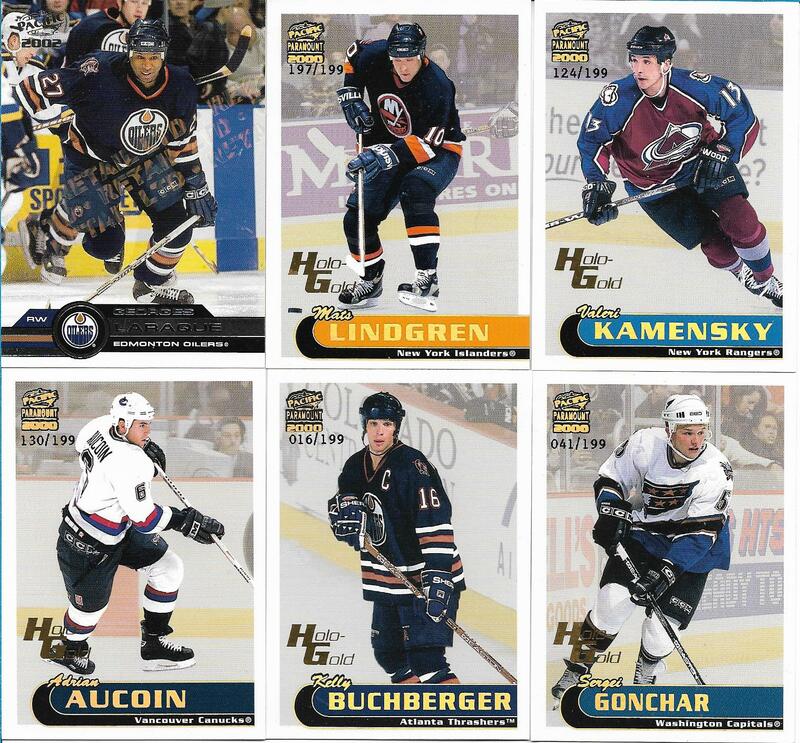 Dennis cornered the market on Holo-Gold parallels from the 1999-00 Pacific Paramount set, sending 7 of them my way. Valery Kamensky is probably the biggest name of the forwards, and it was good to see Sergei Gonchar get a Stanley Cup ring with the Penguins in 08-09, and I don't know about anyone else out there that follows hockey, but I think he merits some consideration for the Hall of Fame. Finally, a bunch of Pacific Revolution cards from back in 2000-01, featuring one player that is still playing in the NHL 17 years later, that would be Patrick Marleau who is now in Toronto. I don't know about you, but those Revolution cards are LOUD! I counted 32 cards gone from the checklist, which is fantastic. Thank you very much Dennis, I need to send some Red Wings your way!! 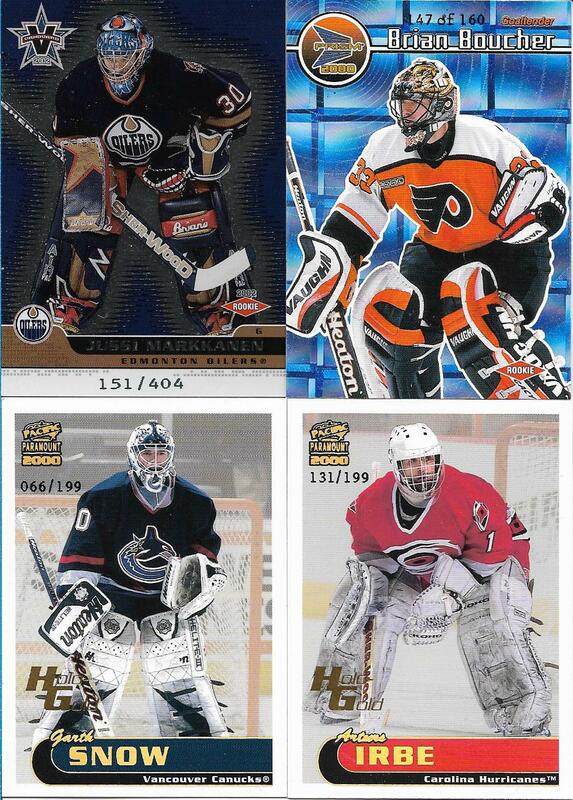 Geez, those Pacific Revolution cards are definitely not my cup of tea. I knew there was a reason I stopped collecting around '99. Yeah, the Revolution ones are textbook Pacific but the Paramount has the kind of design they should have stuck with. I'm glad you were able to use so many, and don't worry about sending Wings my way since I don't actively collect them. If you have any Michigan Hockey NHLers, though, that's a different story! Patty & Friesen. Two of my favorite Sharks of all-time. Great package. I am all about Pacific. These cards were my jam back in the day. I opened so much Pacific back then and never once remember getting a HoloGold. In fact, I don't even think I own one to this day. Maybe, but I don't recall. I seemed to have a love/hate relationship back in the day. There were very few sets that they produced that I was on the fence about. I may be in the minority here, but I actually like the Revolution designs (at least in the other sports, as I don't collect hockey).